Spring also means SPRING CLEANING! And that can mean sorting through SCRAPPING & STAMPING tools and supplies you find you no longer use and wondering what to do with them....and we have the answer! 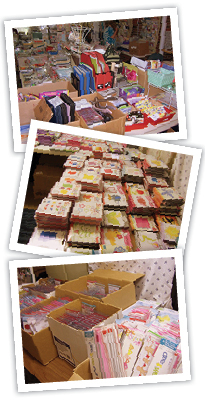 We host our annual Indoor Scrapbooking Yard Sale every year on the weekend after Mothers' Day, from 7 am to 5 pm both Friday and Saturday, and accept signups for seller numbers all year. We hold the sale at the Cozy Crop House in Lititz, and every year have sold literally thousands of dollars' worth of goods to some very happy shoppers! Sellers do not have to be present, and earn Cozy Crop House credit for merchandise sold (credit can be redeemed for album imprinting, merchandise, gift certificates, classes, workshops, or retreats). Once your items are delivered to us marked with your price and your seller number, we manage everything else for you! The small fee goes toward the newspaper advertising. If you would be interested in registering for a seller number and learning more details, please contact us. Of course, if you want to be a SHOPPER, you are welcome, too! Click here to see some pictures from our past Yard Sales.